Since the late 1980s, when alto saxophonist Greg Osby stepped out of bands led by the likes of Dizzy Gillespie, Jack DeJohnette, Jaki Byard and Andrew Hill, he’s been his own man: fronting groups, developing projects and serving a primary role in the influential Brooklyn-based M-Base Collective, along with Steve Coleman, Cassandra Wilson and others. His distinctive attack and compositional approach distinguish his more than 20 albums released under his own name, the majority of them on Blue Note with the unrelenting support of the late Bruce Lundvall. Osby now records for his own label, Inner Circle Music, where he’s also fostered leading young talent including saxophonist Melissa Aldana and vocalist Sara Serpa. And while his sense of commitment hasn’t diminished in the least, Osby, now 55, seems to be willing to take a breath career-wise, allowing elements of chance and whim to help guide the way. Most recently he’s been performing in projects as a featured soloist more than bandleader: next to Joe Lovano and Dave Liebman in Saxophone Summit, and in a quintet dedicated to the music of Lennie Tristano. He’s also the newly appointed curator of the Sopot Jazz Festival in Poland. 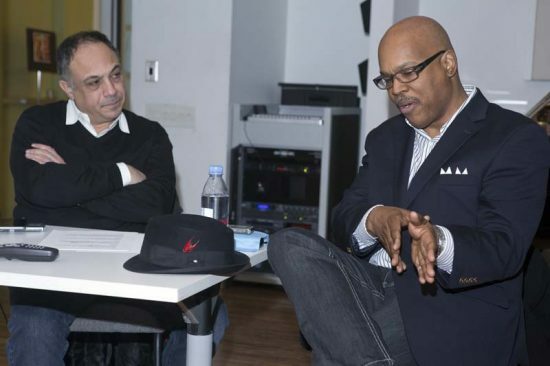 This Before & After session took place at New York University’s jazz facility in early March. “Time to Kill” (The Eleventh Hour, Sunnyside). Blake, drums; Tom Harrell, trumpet; Jaleel Shaw, alto saxophone; Robert Glasper, piano; Ben Street, bass. Recorded in 2010. BEFORE: Very well executed, well produced. Sonically it was a great recording. They sound fairly young-at least 10 years younger than me. The level of players these days is leaps and bounds above my generation. They have more intellectual access; they can learn and absorb faster and retain the information better as well. The alto player seems to be influenced by Kenny Garrett to some degree-Kenny’s been lionized by alto players all over the world, everywhere I go. I really can’t say who it is. It sounds like an institutionalized player, not somebody who apprenticed under somebody. Perhaps it’s someone who earned their bones in school. They sound really accomplished. It could be Antonio Hart or Miguel Zenón. AFTER: I know Jaleel very well, and that didn’t sound like the Jaleel I know. That sounded like it was EQ’d to make it very smooth and more compressed, because Jaleel is a fiery player. His sound is a little bit more strident and raw. It has more bite than that. That’s why I didn’t recognize him, but I enjoyed it. It was very good contemporary jazz. “Good Morning Heartache” (Wildflower, Kudu). Crawford, alto saxophone; Bernie Glow, Alan Rubin, Marvin Stamm, trumpets; Wayne Andre, Paul Faulise, trombones; Tony Studd, bass trombone; Joe Beck, guitar; Richard Tee, organ; Bob Cranshaw, electric bass; Idris Muhammad, drums; Bob James, arranger, conductor. Recorded in 1973. BEFORE: This takes me back. I played this kind of music in high school-jazz-based pop tunes without vocals. This sounds like early to mid-’70s, one of those Creed Taylor[-produced] recordings. That had to be Hank Crawford because of the way he attacks those notes, a stabbing of the notes. His sound has a lot of core, a lot of midrange. It’s not what you call a fat sound, but it’s very distinctive, very detailed and sounds like a person singing. He made really good use out of the pentatonic and the blues scales without a lot of harmonic alterations. AFTER: Yeah, that whole crew-Joe Beck, Bob James, Idris Muhammad, Cranshaw. Man, that was in the air in St. Louis. Practically every bar, joint and pool hall had a Hammond B3, and all the jukeboxes had these toe-tappers, as they called them: “The Sidewinder,” “Watermelon Man,” “Song for My Father.” Grits-and-gravy, chicken grease. Lou Donaldson, Groove Holmes, you name it. This was the west side of town. But I hated it as a kid because everywhere you go you’d hear this funky chitlin’ stuff-scratchy guitar, some guy playing out of tune on a tenor saxophone that was held together with rubber bands and paper clips and gum and Band-Aids. So I didn’t like it. At first. But when I got serious about my instrument of course I gravitated to that and I became the go-to guy, the young bluesy cat. I was 15, 16 years old in these bands with guys in their 30s and 40s, playing the kind of music where we would vamp a tune, just one chord, “Mister Magic” or something like that. We’d play it for 35 to 40 minutes for dancing, in these big halls where there’d be motorcycle gangs, the Elks, Masons and other people. “Talin Is Thinking” (Bird Calls, ACT). Mahanthappa, alto saxophone; Adam O’Farrill, trumpet; Matt Mitchell, piano; François Moutin, bass; Rudy Royston, drums. Recorded in 2014. BEFORE: It does sound like a modern group. They’ve created an environment that’s not directly reflective of the swinging jazz tradition, but it’s another branch on that tree that’s kind of spidered out a bit. This sounds like Rudresh Mahanthappa. He has a very, very personal approach [and] a very, very personal group concept and logic. He’s very clear about his objectives within the parameters of that music; he stands behind it; he could explain the components that he uses to construct his environment. It’s something for someone [to be able to] emerge from the jungle of trends and illusions and sound like something that’s well thought out, well conceived and well executed. The natural tendency for most players is to copy, to emulate and then to ride the wave of accomplishment of someone else’s sound-to take credit for someone else’s sacrifices. 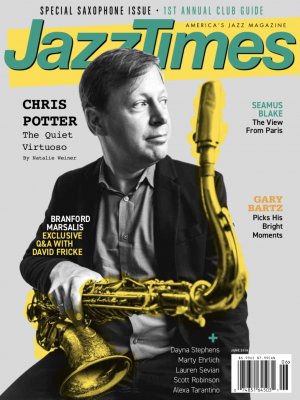 Even with some of my students these days, I’m like, “Man, you sound like a shadowing of Mark Turner,” or, “You’re consumed by Chris Potter.” And they say, “Really? Thanks!” It’s a compliment to them. [laughs] But really, developing an identity should be at the top of the list of concerns for any young player, or any lecturer or instructor. AFTER: I caught the opening of “Parker’s Mood” [on which Mahanthappa’s composition is based]. I wanted to see how far he would go, because he really can dig deep. He can go toe-to-toe, he’s a musical boxer and I’ve seen him in flight. I love to see somebody play with that level of conviction and be consistent. He’s like that all the time-that’s his sound. Again, I applaud him for it. “September Song” (The Legendary Buster Smith, Atlantic). Smith, alto saxophone; Herman Flowers, piano; Josea Smith, bass; Robert Cobbs, drums. Recorded in 1959. BEFORE: Very, very close-mic’d, so close you can hear the saliva bubbling in the mouthpiece, which to me lends this a level of humanity you can’t get with a machine. It sounds like him taking a breath. [It sounds like] somebody who’s a heavy drinker and a heavy smoker. It just sounds like life, like somebody who’s lived. There were so many elements about that tune that were cool. One is the idea that they held the tempo and maintained the bluesy feel and the integrity of the environment without a lot of hysterics. The drummer held it down, the bass player held it down, the piano player kept the riff. The piano is out of tune, but even that lent something to the feel-very saloonish, honky-tonkish. Another nice issue is the exhibition of restraint, the ability to tell a story without over-telling it, without giving away the finale before it arrives; the ability to use the bare essentials to get the point across without a whole lot of showboating. I didn’t recognize the ballad. They sound older. Just a shot in the dark-it sounds like late Johnny Hodges, Eddie Vinson or Willie Smith, because I heard scoops in the tone, which is a stylistic characteristic of Johnny Hodges. But then there are intonation issues that I’ve never heard from him. Johnny Hodges was always on point, never flat-maybe just a little bit sharp-but it seems to be affected. AFTER: I said Willie Smith as opposed to Buster Smith, whom I never would have considered, but again, there’s that lead alto sound. This definitely sounded like later in his career. I could imagine him playing with a cigarette in his hand at the same time, and during the piano solo he probably took a swig from something. It’s like a snapshot of a time, and that’s why playing music like this for younger people and acknowledging it is so important. It’s transformative. “Miss Nancy” (Illusions, Columbia). Blythe, alto saxophone; John Hicks, piano; Fred Hopkins, bass; Steve McCall, drums. Recorded in 1980. BEFORE: Again, a lot of really cool elements. First of all, his saxophone tone sounds very alternative. A lot of saxophone players play the exact same brand of saxophone, the same reeds and mouthpieces, so there’s a uniformity in terms of options because everybody has the same speaking voice. But this was very obviously not the typical setup-it didn’t sound like anybody else playing alto saxophone. Also, it was a swing environment but he wasn’t coming from the bebop lineage; he had a different way of negotiating that environment. That sounded like Arthur Blythe to me, also known as Black Arthur. He was one of the first cats I heard live in New York and he was very cool with me, very embracing and generous with his time and information. I was really dismissive of that kind of playing at first, because I was a young bebop nut. I liked playing the changes. I didn’t hear the blues, I didn’t hear the outline of the chords and stuff, so I rejected a lot of those cats until I played with them. I used to sub for Julius Hemphill in the World Saxophone Quartet because he was getting ill at the time, so I got to stand next to David Murray, Oliver Lake and Hamiet Bluiett. I’m 24, 25 years old and I’m in this sea of sound and there’s a lot of devices and a lot of output that they were able to elicit. There’s no word for some of what they can do, and it’s not taught in schools. There’s a whole generation of players who some may think leapfrogged over playing changes, but they actually figured out other ways of expressing themselves. AFTER: This took me back. I used to play in David Murray’s big band every Monday night at Sweet Basil, and in Lester Bowie’s big band and Jaki Byard’s big band sometimes. Philly Joe Jones had a big band at the Jazz Cultural Theater on Eighth Avenue. There were a lot of situations for players to get their feet wet and test the waters. I’m just glad I came to New York when I did. Excerpt from “Small World in a Small Town” (You’ve Been Watching Me, ECM). Berne, alto saxophone; Matt Mitchell, piano. Recorded in 2014. BEFORE: [during the first half of the track] I liked that a lot. They’re playing duo. The piano is one of the most difficult things for a saxophone player to accompany if you want to stay engaged through the whole performance and not just stand off to the side when you’re done soloing. There wasn’t much of a melodic statement in the beginning; they kind of were off to the races early on. In terms of structure and identifying a platform there wasn’t much, but I still dug it. I’ll take a guess-it could be Tim Berne with Myra Melford. I know they have a very profound working relationship. Tim’s sound is very broad. That sounded like how I remember him sounding, but I haven’t heard him in a number of years. I’ve seen him in airports when we’ve both been running for planes more than I’ve actually heard him live. AFTER: A lot of this kind of music is much more engaging when experienced live than listening to it as a recording, because you get caught up in the environment and the company around you and their responses. You can feel the dynamic and look at the musicians. “In a Sentimental Mood” (Lawrence Welk & Johnny Hodges Orchestra, Dot). Hodges, alto saxophone; Welk, conductor, bandleader; Lawrence Welk Orchestra; Jerry Gray, arranger. Recorded in 1965. BEFORE: Great arrangement and very effective, being that brief. If it’s not Johnny Hodges, then whoever it is is missing a good chance to be Johnny Hodges. AFTER: As the old cats used to say, he’s wearing Johnny Hodges’ old, dirty underwear. His approach to the saxophone is almost classical: impeccable intonation, attack, breath control, air flow. His air stream is very centered. I don’t like to use the word “lyrical” because it’s overused, but there is a very vocal aspect to the way he plays-like a woman singing, or that he’s addressing a woman; legend has it that was the actual motivation behind just about everything he did. A lot of people sleep on Johnny Hodges, thinking that he’s primarily a sugarcoated, schmaltzy balladeer, but he was also a masterful technician. He was very adept at negotiating really interesting passages with very clean and precise articulation. It’s a school of playing that sorely needs to be revisited, in terms of people being complete. “Half Nelson” (19 [Solo] Compositions, 1988, New Albion). Braxton, alto saxophone. Recorded in 1988. BEFORE: That was great. Reminds me of my early days in New York. This isn’t candlelit dinner music; this is something I would sit around and listen to with my friends and we would play it back and try to figure out how it was executed-because some of those techniques can’t be notated. Someone has to show you that and help you figure out how to make the instrument speak. That sounded like it could have been [Anthony] Braxton. Or Roscoe Mitchell, Joseph Jarman-one of those AACM-type cats. He took “Lady Bird” and used that as a starting point, but he already had one foot in the catapult and then he was off! He made references to the form every once in a while, but even in the beginning it reminded me of some of the old Delta blues guitarists who may be sitting in a rocking chair on the porch with a hound dog at their feet, and they play a 12-bar blues but sometimes it might be nine bars, 11 bars, 13 bars. It’s a flexible form-compression, expansion-and he didn’t strictly stick to the form of “Lady Bird,” even when he was playing the melody, which is cool. That sounded like some things I’ve heard Braxton do solo that I’ve never heard anybody else play: the fat sound, a lot of the double-tongue. It’s almost like ringing out a dishrag to the last drop, just drawing out some sonorities on the saxophone that are still a mystery to me. AFTER: “Half Nelson.” Yeah, the same tune, same changes. He really showed his soul on this one. A lot of people aren’t aware that he’s capable of that; they just think he’s from the fire school. I’ve had many, many fruitful one-on-ones, speaking with him until the sun came up in Europe at festivals. For the past 30 years or so, every time he sees me he says [imitating Braxton’s professorial way of speaking], “Oh, oh, oh, Mr. Osby, good to see you. I’m seriously going to have to break your fingers,” meaning that I’m taking gigs away from him. “You’re sounding too good.” He’d say that to me when I was young, joking with me, and he still says it. “Air-Iwori” (The Mancy of Sound, Pi). Coleman, alto saxophone; Jonathan Finlayson, trumpet; Tim Albright, trombone; Thomas Morgan, bass; Marcus Gilmore, drums; Ramon Garcia Perez, percussion; Jen Shyu, vocals. Recorded in 2007. BEFORE: [immediately asks to stop the music] That’s Steve. Not George Coleman, not Ornette-Steve. I recognize him from when he played one note. Before he even got into the very, very, very distinctive aspects of the way he puts his music together I knew it was him. So he could be playing nursery rhymes, anything at all, and still be very effective in multiples of environments. That to me is mission accomplished. [music resumes] I really liked this. I know the core of his band-Jen Shyu, Jonathan Finlayson. I don’t really know the rhythm section; it may be Sean Rickman and Anthony Tidd. Or Marcus Gilmore on drums. AFTER: I love his music. I listen to it with different ears now. This is the result of his many years of research, and he’s done sabbaticals, he’s done a lot of decoding. He’s engaged in the pursuance of properties that more clearly illustrate his idea of the world as he sees it, and he’s consistent. We used to collaborate a lot, and then I had to withdraw because of the weight of what he’s doing; his ideas are very strong and he’s very, very solid in his decision-making. Even when we were working together a lot exclusively, I made sure I didn’t get inside what was behind what he was doing. I didn’t pursue his methods in detail. I didn’t want to decode it to the degree that it became a component that I would use. I was very diligent in creating my own thing that hopefully would be as profound and as strong as his thing. Of course, due to osmosis and close association there will be some crossover. But sometimes one has to break away in order to find themselves. Sounds like M-Base was more conversation than collective. There was a great deal of discussion, yes. We butted heads and disagreed on a lot of things, which I think is healthy. Back in the day we had a lot of spirited debates on what was valid and what was necessary-what should be included, what should be dispensed with. I think musicians should engage in those healthy intellectual and structural jousts. That was at the heart of M-Base: very charged rehearsals and discussions and telephone conversations. It was a very fruitful time. “Zion Hill” (Love Cry, Impulse!). Ayler, alto saxophone; Call Cobbs, harpsichord; Alan Silva, bass; Milford Graves, drums. Recorded in 1968. BEFORE: There was something very folksy about this, but there are two elements in playing that really don’t settle well with me: One would be repetition and the other would be pointless meandering. They both wear on the patience of the listener, depending on their level of inebriation of course. As the saying goes, the more you drink the better we sound. But just in terms of it being kitschy and mildly interesting with the coupling of the harpsichord, it serves a purpose to the point that you faded it out, which was about as much as I could stand. It was like, OK, now where’s it going, or what’s the point behind it? The melody was very straight; it wasn’t embellished very much, so it started to cycle. It wasn’t Ornette. I don’t know who that was. I have no idea. AFTER: I never really heard Ayler play alto-“Zion Hill.” It did have some churchy aspects, and whenever I hear something that’s overtly gospel I recognize it for what it represents in terms of the lexicon and language. But I’ll be honest, I’m a bit different from some people, because things that remind me of church bring back memories of sitting through long sermons with my legs swinging, sitting on that hard bench. I’d get pinched because I’m fiddling-“Boy, sit still!” It’d be hot, and all the ladies were cooling themselves with those funeral fans, and it was kind of like a horror show. Some people are like, “Oh yeah, the church, praise Jesus.” When I think about it I’m still like, man, it was a punishment. I couldn’t wait to get out of there.